Here I am sharing with you a little prequel to what my husband has been up to. Feel free to check out his other artwork at Etsy. 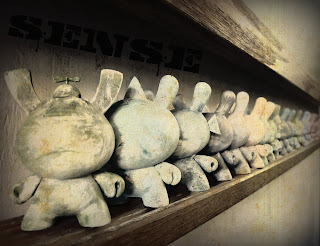 He is Zdenek55 aka Sense These are dunny's in their first stages of his process. I stole a moment to take a neat picture of them on our old skool chalk board. He is so handsome sitting here next to me as I poke through fiber and he dips deep into paint. I truly love this boy with all my heart.